Sprint gets carrier billing in Android Market | Android Blast! 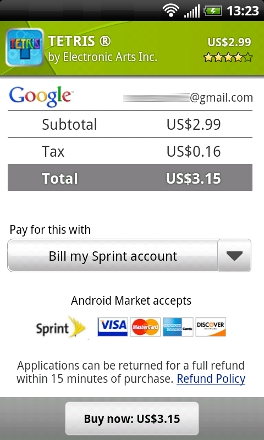 Sprint is finally getting a carrier billing option for purchases made in the Android Market. T-Mobile has had this option since 2009, and AT&T got it in 2010. Better late than never, Sprint joins the rest of the crowd in 2011. What does it mean? It means that Sprint customers have the option to pay for their Android apps through Sprint. "The momentum continues and today we�re excited to announce that Direct Carrier Billing is now available on Sprint. We've begun a phased roll-out of the service that will reach all users in the next few days. When complete, Android users on the Sprint network will be able to charge their Android Market purchases to their Sprint mobile bill with only a few clicks. We believe that Direct Carrier Billing is a key payment option because it lets users purchase and pay for apps more easily. It�s also important because it offers a convenient way to buy in regions where credit cards are less common. We are continuing to partner with more carriers around the world to offer carrier billing options to their subscribers. Watch for announcements of new payment options coming in the months ahead."